The basic triad of Dandy-Walker syndrome (DWS) is the supratentorial hydrocephalus, the posterior fossa cyst, and dysgenesis of the cerebellar vermis. 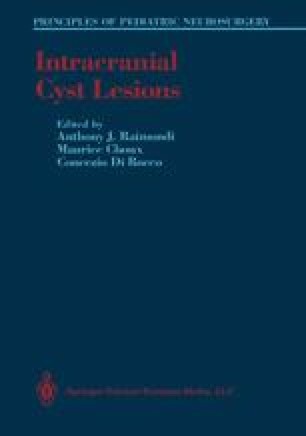 In this chapter, we review 37 cases of DWS treated at Cook County and Children’s Memorial Hospitals in Chicago between 1963 and 1977, and 26 cases of the posterior fossa cyst, including 2 cases of DWS, diagnosed at the Juntendo University Hospital in Tokyo since 1978. On the basis of these investigations, we present clinical, neuroradiological, and surgical features of DWS and offer a review of the literature.